France announced today that it will supply arms “in the coming hours” to Iraqi Kurdish forces who are fighting jihadist extremists of the so-called Islamic State of Iraq and Levant. President of the Republic of France François Hollande broke the news in a written communiqué. 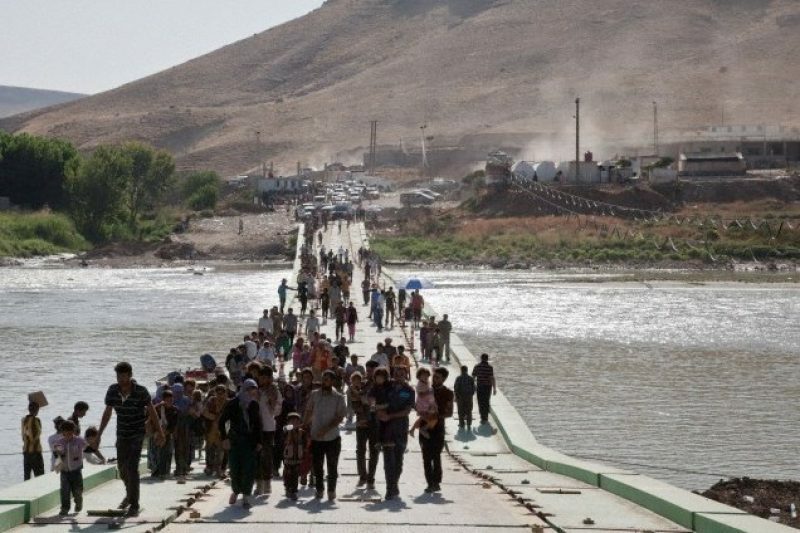 Many of the Christian minority Yezidis who fled to Mt Sinjar have made it to the Kurdish town of Makhmour (see pic above), re-taken the other day by the Kurds after ISIS forces had overrun it earlier. There is still no information available from the Elysée Palace as to precisely what kind of arms the French are supplying the Kurds with but what is known is that this delivery of arms was decided in coordination with the authorities in Baghdad. Yesterday evening, EU ambassadors had an emergency meeting in Brussels to discuss this vital subject of arms deliveries but failed to reach a common position on the matter. The question is likely to be broached once more during the ministerial meeting that is due shortly following request from Italy and France. “I know that for Western countries, this is the holiday period, but really, when people are dying, it’s time to come home from holidays,” said Laurent Fabius, the head of French diplomacy yesterday, while EU capitals agreed to “urgently reinforce the humanitarian coordination and to access displaced peoples” in Iraq, as well as allowing member states that wished to deliver arms to the Kurdish combatants. Paris decided, therefore, to act without waiting. It was a case of responding to Kurdish requests in terms of arms and ammunition – requests that were expressed particularly during the visit of Fabius last week to Erbil, capital of the Kurdish autonomous region. This French decision is a highly significant one. It puts them into a position of being a direct arms supplier fighting against an Islamic state – one which has reportedly been blazing a trail of murder and civilian displacement across Iraq and Syria.